The TRILO SU60 is perfect for quick clearing and collecting piles of leaves from inside and around sports complexes. 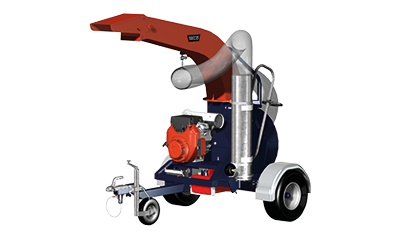 The TRILO SU60 suction unit is mounted onto a chassis that can be used as a trailer. The chassis is equipped with lights and suitable for use on public roads at speeds of up to 80 km/hour. The SU60 has a reliable 20 HP Honda petrol engine. The fan is located in a wear-resistant dual walled fan housing. The SU60 is standard equipped with a 5 m long wander hose with a diameter of 250 mm. The wander hose also includes a robust metal end piece with hand grip. While working, the wander hose is supported by a pivoting boom and can be tucked away in a bracket. The fan house is easy to clean, Excess water is drained using a drain with a cap. The adjustable reverse exhaust spout can be turned 360 degrees and adjusted to any desired angle, so you can blow materials into the most inaccessible areas of a vehicle’s bin. • A 5 m wander hose with Ø 250 mm. • Can be transported over public roads (80 km/h). • Fan housing protected by exchangeable wear plates. • Water is drained via drain with cap. "Clearing leaf waste is much easier with the TRILO SU60s"
Four TRILO SU60 suction units are the newest acquisition by the town of Wolverhampton and they quickly made the huge task of clearing leaf waste much easier.